Overflowing with warmth and charm, GREYFRIARS BOBBY celebrates the powerful bond between man and a kind and loving animal. 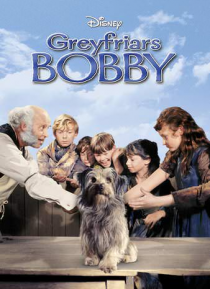 Based on Eleanor Atkinson's immortal children's book - Walt Disney presents the remarkable true story of one of Scotland's most beloved and celebrated heroes - a terrier named Bobby! The enduring friendship forged between a tenderhearted shepherd known simply as Old Jock and h… is devoted dog cannot be broken - even by the kindly old man's death. Set in bustling Victorian Edinburgh and the breathtaking Scottish countryside, GREYFRIARS BOBBY is a sensitive tale of uncommon loyalty and affection that is certain to delight and inspire one and all!